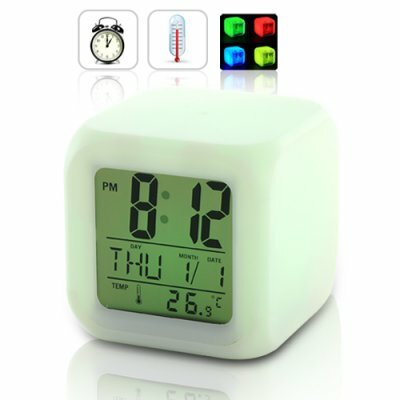 Successfully Added Fantastic Trip Color Changing LED Mood Alarm Clock to your Shopping Cart. At night you can be passionate with the one you love to it, basking in this clock's soft beautiful glow...like Romeo and Juliet making the most of the dawn before they must separate...forever. Or if you're experiencing insomnia, just stare into the Fantastic Trip Color Changing LED Mood Alarm Clock's soft changing LED glow and be lulled into a deep peaceful sleep. This is the perfect device to help you achieve delta and gamma brainwave frequency for that ocean bottom type of peacefulness that previously only buddhas could enjoy. Better yet, throw on a pair of our Studio Sonic headphones [http://www.chinavasion.com/speaker-headphone-earphone/uhf-wireless-headphone/], turn on some binaural beats and chill the max out. Light and color fantasia...sacred journey meditation at its best. Perhaps you'll find the answers you've been searching for all your life. Remember, as Friedrich Nietzche once wrote: when you look into the color changing LED clock the color changing LED clock also looks into you! It's the perfect gift for your stoner friends, the rave girl in the mailroom, your nephew with the Bob Marley tee shirt collection, the guys in IT (because they're geeks of course), or anyone who you find it hard to shop for. No, seriously who wouldn't love to receive a cool color changing LED alarm clock as a gift? Better yet this makes a great resell item for your alternative medicine store, spa shop, or cool gadget site. Buy low, sell people my friends, said Adam Smith (or one another of those dead economics guys). Brought to you by the wholesalers of collective coolness, Chinavasion. Sell it in your headshop! This device is best used with medication. No staring at the lights will not invoke seizures because it's a slow changing light. You may be overcome with fits of groovy though.